The key to understanding how to produce products with low response time, low inventory, and flexibility can be found in this important text. Using a systematic approach, this unique analysis of contemporary manufacturing processes identifies family characteristics of individual processes to facilitate learning. 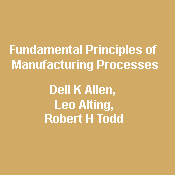 Using the same classification system, detailed descriptions of each individual process can be found in the Manufacturing Processes Reference Guide by the same authors. Identifies and studies six families of shaping processes that change the basic geometry of shape of a workpiece (Mechanical Mass Reducing, Thermal Mass Reducing, Chemical Mass Reducing, Mass Conserving, Consolidation, and Joining) and four families of nonshaping processes that modify the engineering and aesthetic properties of materials (Hardening, Softening, Surface Preparation, and Surface Coatings). This classification, or taxonomy, now used in the United States and Europe, is a valuable tool in identifying processes and their capabilities. General Structure and Organization of Manufacturing Processes. Mechanical Mass Reducing Processes. Thermal Mass Reducing Processes. Chemical Mass Reducing Processes. Consolidation Processes. Deformation Processes. Mechanical, Thermal, and Chemical Joining. Annealing Processes. Thermal Hardening Processes. Surface Preparation. Surface Coating. Index.